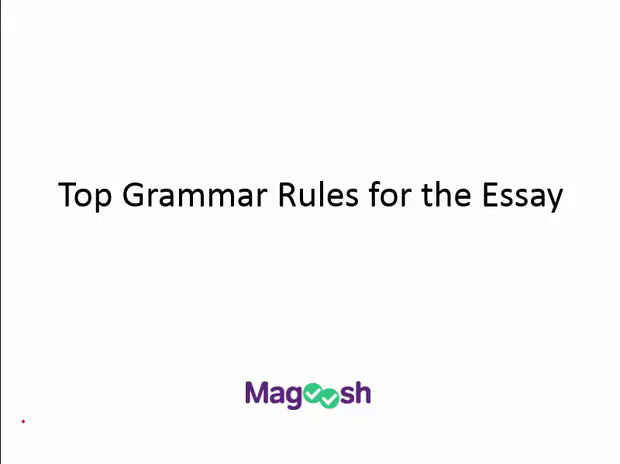 In this Magoosh writing video, we're gonna talk about our top grammar rules for the essay. Now, these are the things that people tend to do wrong when they are writing quickly and coming up with ideas and sentences and phrases off of the top of their heads. So I don't blame you if you make some of these mistakes. I make them too when I'm writing quickly. But, what you wanna do is be aware of them so when you are in your proofreading period of the essay you can look out for these major grammar and mistakes. Okay so we're gonna go through each of these individually but here they are. Parallelism, the empty this and the abandoned it, homophones, comma splices and comma fragments, misplaced modifiers and noun and verb consistency. Now, I want to emphasize that graders are trained to look for patterns of mistakes on the test, so they're gonna forgive little slip-ups if you mess up on one of these things once. No big deal, they know that it is a timed assessment, and you're basically just writing a draft. But if they see you making the same kind of mistake over and over, or lots of little different mistakes, then you can absolutely be sure that you're gonna lose some points for that. So, let's talk a little bit more about what you should be looking out for so you don't lose those points. All right first of all, parallelism. Now you can check out our grammar videos for more on all of these topics that are in the English section of the Magoosh ACT but this is just a quick refresher here. All right so parallelism, or you may know of this as parallel structure. Let's look at an incorrect example first. In order to get into the robotics program, I had to do two things: come up with a promising research idea and I had to look for two other students to form a team with. Now that may not sound terrible, but we have some incorrect parallel structure here. So we start to this part here, we come up with a promising research idea and we get rid of that extra subject verb there. This is also grammatically incorrect because if that was the case, we would need a comma and an and here. So here, let's look at our correct example. In order to get into the robotics program, I had to do two things, come up with a promising research idea and form a team with two other students, so that would be better. So if you see this on the test, you see that you did that, no big deal. You just do what I did here, you fix it. Cross it out, it's totally fine as long as you are neat about it. All right, the empty, this, and the abandoned, it. What do I mean by this? An empty, this, is when you're wondering what does, this, refer to in the sentence when you say it. So for example, incorrect, placing first in the robotics competition helped me gain confidence. This also helped me give a better idea of how to work in teams. What does this refer to? Now you as a logical human being know that this probably refers to placing first in the robotics competition, this idea of placing first. But we have some other things, some other nouns that this could potentially refer to. So we want to eliminate any confusion at all. Remember, not only are we writing quickly, but our graders are reading quickly as well, too, so let's make everything crystal clear for them and say something like this. Placing first in the robotics competition helped me gain confidence. This experience also helped give me a better idea of how to work in teams. So now we know it was the experience that did that. The abandoned it, very similar. It's when we're wondering, what does it refer to? So, incorrect. Learning how to work in teams is important to success, as my experience with the robotics competitions shows. It also helped me figure out how to resolve disputes. We wanna make this, it clearer, and say something like this. Learning how to work in teams is important to success, as my experience with the robotics competition shows. My experience, crystal clear, also helped my figure out how to resolve disputes. All right, next one. Commonly confused homophones. Now homophones are words that sound alike, but are written differently and mean different things. So this is something that lots of people do when they are writing very quickly and then they can go back and they can catch themselves. Things like its and it's. Should be an s there, sounds exactly alike but it's means it is and its with just an s means that's the possessive one, so be looking for that. Their, there, and they're, all mean three different things. Two, to, and too also mean three different things. Effect and affect. Those mean different things. Effect is the noun, that is when something is the result of something, and affect is our verb. The poor grade that she got on the ACT really affected the rest of her school year. Now, one other thing I wanna mention here is to not use text abbreviations. Now I know you wanna say I would never ever do that in an essay. But, I can tell you as an English teacher in high school, I saw students do this. I know some of you do. So, fix that habit right now. But remember, this is also something you do when you're writing really quickly. When you're texting, you're trying to get a message across very quickly and so you say u, like this, or ur, or 2moro. If you catch yourself doing that go back, fix it, cross it out, write Y-O-U. You can fix it, just make sure you're looking out for doing that as well. Comma splices and sentence fragments, this is our next category that we want to be watching out for on the test. These are really easy to do when writing quickly because you're just coming up with those sentence off the top of your head. You're not exactly looking at the big picture. So a comma splice, again, is when we join two sentences that could stand alone with just a comma. So, for example, incorrect, for our first task we had to have our robot throw a basketball through a standard sized hook, it did this perfectly. These could stand alone as sentences, so that would be wrong. We need to fix that comma there, that comma splice. For our first task, we had to have our robot throw a basketball through a standard sized hook, an action it executed perfectly. So this is one way to fix it. We made it a subordinate clause, we could fix it other ways. On a test maybe we'd want to just add an and there or change that to a semi-colon. But we wanna fix that in our proofreading, period. Here's a sentence fragment. A bunch of sentence fragments, actually. Next, our robot had to travel over a small wooden bridge without falling off. Running into slight problems here. Then tumbling off the bridge. Which ended in flame. So you're just like, reliving this moment of this robot competition, you're really excited, and you're just making not sentences. So, we'll fix that in our proofreading period and we'll make it all one smooth sentence. Next, our robot had to travel over a small wooden bridge without falling off, yet. Conjunction here. It ran into a slight problem here, tumbling off the bridge and bursting into flames. We made this last one a subordinate clause and we connected these two ideas and now we have this nice eloquent sentence. Misplaced modifiers, also something to be watching out for on the test, also easy to do when writing quickly. Wanting to win, our robot was completely dismantled and rebuilt overnight before the competition. Now having this clause right here next to robot implies that our robot was wanting to win, which maybe he was, but that's a pretty sophisticated robot if you've created this intelligent thinking machine. I don't think that's what you meant to say. You meant to say something like this. Wanting to win, we completely dismantled and rebuilt our robot overnight before the competition because we wanted to win. Noun and verb consistency, this is something that I see a lot and I do a lot when I'm writing really quickly because you're just thinking about the ideas, you're not thinking about exactly how you put it. So here's a sentence that would be incorrect. Robots range from the incredibly complex to the shockingly simple; it can be anything from an intelligent machine that can embarrass a Jeopardy champion to a couple of pieces of metal strapped together to mechanically pound a nail. Well that sounds like a pretty nice sentence. What's wrong with it though? Well we have robots here. That's plural. And then look. We have a singular pronoun here. So we are not being consistent with our nouns here. So we need to fix that. Robots range from the incredibly complex to the shockingly simple, and they can be anything from an intelligent machine, blah, blah, blah. Now again If you do that once on the test, the graders are gonna forgive you. They understand. But if you're doing it as a pattern, then it's going to be a problem, so also something you want to watch out for. All right, what can you do to catch these common grammar errors? How can you solve this problem for yourself? Well one of the most important ways, or most effective ways, that you can practice this, is to edit your practice essays and notice the grammatical errors that you make while writing quickly. So you're writing to catch them during a brief proofreading period on the test. So I call these the errors I always make, the mistakes I always make. And it's a really good idea to keep a list of them so that when you go to take the essay on the ACT you have a list ready in your mind. I gotta watch out for not confusing two and two or whatever it is that you always do. All right. But here are the things that you should particularly watch out for because they're some of the most common mistakes that people make. Parallelism, empty this and abandon it, homophones, comma splices and sentence fragments, misplaced modifiers, and noun and verb consistency. All right. Go write some essays, practice proofreading, make sure you keep these things in mind.